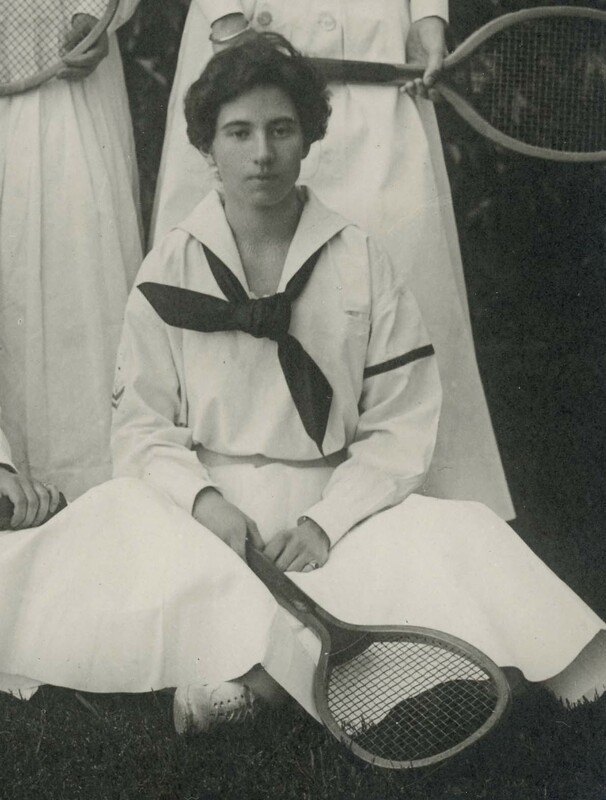 Cynthia Wesson, Class of 1909, is pictured here with the other members of the 1909 Varsity tennis team. In 1902, alumnae established the Trophy Club, reflecting their ongoing interest in athletics and competition at Bryn Mawr, as well as their desire to create a connection between generations of students. We hope that the sight of the very choice relics enclosed in the case will incite our own students and those who come later to carry on our own customs and form new ones, so that we shall need more cases to hold our relics. Then will the small institution grow, until some day it will become an indispensable part of the College. Then, too, by upholding its purpose in preserving these small reminders of past events, it will awaken the memories and renew the ties of former associations and friendship and will help to form new ones. In this way the college spirit of which we are so proud, if it cannot be increased, will at least be perpetuated 1. The Bryn Mawr College Alumnae Bulletin demonstrates the continued interest of many alumnae in athletic happenings at Bryn Mawr, regularly reporting the winner and score of intra- and extramural matches for the benefit of alumnae. By the turn of the twentieth century, Varsity-alumnae games during Commencement week had become a beloved tradition. In 1916, Bryn Mawr alumnae in New York City joined other graduates of women's colleges to form the Intercollegiate Alumnae Athletic Association "for the purpose of providing inexpensive athletic facilities for college women" 2. Cynthia Wesson, Class of 1909, stands out as an alumna who remained especially strongly engaged in athletics at Bryn Mawr and beyond after her own graduation. She served as a dormitory warden at Bryn Mawr, and then as Assistant in Athletics and Gymnastics for several years, regularly donated money for gymnastics apparatus, and donated over $7,000 for the construction of a swimming pool in the college's second gymnasium. She also organized alumnae athletic activities, and sought out opportunities to compete beyond Bryn Mawr, gaining recognition for her prowess at field hockey in particular. 1. E.U.B., '02. "Trophy Club." Lantern, vol. 11, June 1902, pp. 88. 2. Ecob, Katharine G. "An Intercollegiate Alumnae Athletic Association." Bryn Mawr College Alumnae Quarterly, vol. 10 no. 4, January 1917, pp. 143.